Metal Geeks | MSRcast and Metal Geeks Unite! 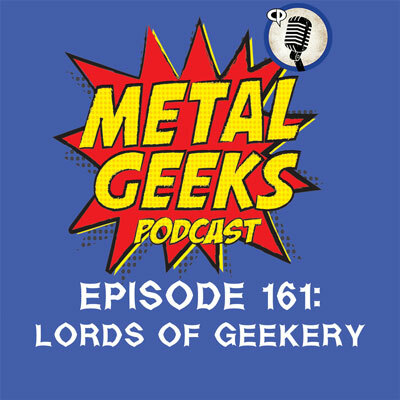 Your hosts, Cary the Metal Geek and Brutal Dave convene to discuss a plethora of topics including Sherwood Forest Faire, Robin Hood, Lloyd Kaufman, Troma films, Amazon and Lord of the Rings, Mystery Science Theater 3K and Mac and Me, Fallout 76, Kingdom Hearts 3, The Legend of Buster Scruggs, the Haunting of Hill House, The Orville, and our topic takes us deep into our childhood memories of music, as well as the Metal band, Black Therapy. In this episode, the gang discusses Kingdom Hearts 3, the Haunting of Hill House, our discussion goes deep about Disney reboots and live action remakes and we jam some Tyr in George Hates Metal and so much more! Joining your metal loving, geeky hosts this episode is the spectacular Metal Pigeon himself, direct from our sister show, MSRcast, as we travel along the path to geekery and discuss Spider-man: Into the Spider Verse, some of our holiday traditions, Avantasia, how crowded will Star Wars land actually be, Universal Hollywood, bumping into Drew Barrymore, Aquaman, Bumblebee, Teen Titans Go!, Harvey Birdman, True Detective, Arrayan Path in George Hates Metal, whats tickling our geeks, and so much more geekery!